This review has appeared on www.thethailandlife.com, an influential blog that publishers articles and views on just about everything about Thailand. It has been a while since I read a really good “life-story” book from a Thai author. In fact, the last would have been the heartfelt stories of celebrated Thai writer Pira Sudham. Not because I haven’t wanted to, mind, but because nothing has really pulled at my attention since that. The last time I browsed the mall bookshops the Thai section was clogged by a stack of ‘how to survive in Thailand’ slash ‘cultural insights’ type books, written by foreigners, who, as any Thai bookworm will tell you, all too often grossly misinterpret Thai culture and “Thainess” through their individual experiences of tourist hotspots and subsequent retirement in Nakhon Nowhere. Some might argue that on occasion I’m guilty of this too. I wouldn’t disagree. The truth is, it is always better to hear it from the horses’ mouth, so to speak. The Boy With A Bamboo Heart is the life story of Dr. Amporn Wathanavongs, a man who overcame the depths of poverty to become one of Thailand’s most treasured philanthropists. 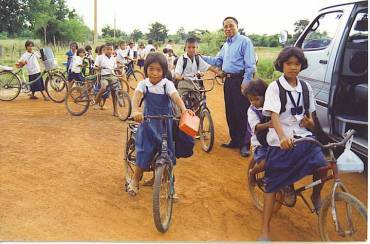 Dr. Amporn went from an orphaned Surin street kid to a globally respected child welfare expert, who in his time has met former U.S. president Jimmy Carter and the late Pope John Paul II. “I was a beggar and a thief,” Amporn told UCA News. He spent 12 years on the streets, totally illiterate and living solely by his wits and intuition. At his lowest point he tied a rope around his neck and tried to hang himself. And when that failed, he drank insecticide that put him in a comma for five days. “It was too hard to live, and too hard to die”, Dr. Amporn recalls. And it’s this sentiment that puts your heart in your mouth from the very start of the book, when Lek, as he was known back then, lay on his shared bed, clinging to his dead mother, who had passed away during the night. As the sun penetrates through the cracks in the bamboo wall of their dilapidated hut, a darkness falls upon his world that will cease to lift for many years to come. And so the story begins to unravel; written by Chantal Jauvin, an international barrister and seasoned world traveller of French-Canadian descent. Jauvin met Dr. Amporn on a trip to Thailand and, realizing her potential as a writer, he asked her to write his story. This was to become Jauvin’s first book, written in both English and French. After that day back in March of 2010, Jauvin revisited Thailand many times to perform hundreds of hours of interviews and research in order to understand his voice and learn of his harrowing story. With great patience, in person and across the ocean, Dr. A, as he is affectionately known to Jauvin, shared his memories, entrusting her with what the book reveals to be painful details of his years as a homeless, hungry and destitute young boy. With his father already dead, the passing of his mother meant Lek was orphaned at the age of six. From scrambling for the basic necessities to survive in the markets of Surin, to trekking through the Cambodian jungle as a fifteen-year-old boy soldier, brandishing a rifle, at times you would be forgiven for thinking this was fiction. These distressing experiences see Lek spiral down a path of self-loathing, with only small acts of kindness from others able to surmount his continual thoughts of self-harm and suicide. But is it Worth Reading? This was no doubt a difficult project, one that would have taken a painstaking amount of understanding to relay in the first person. And Chantal Jauvin should be extremely proud of how well she has delivered and appropriated Dr. Amporn’s story. The Boy With A Bamboo Heart is brilliantly written, a compelling read that takes you beyond the beaches and bars of the Southern Islands, outside of the fancy malls and modern condos that reach into the skyline of Bangkok, and into the depths of one of the poorest provinces in Northeast Thailand (Isaan), where a hand to mouth existence is still common for many today. Jauvin’s writing blesses the pages with a descriptive style that evokes a constant visual of Lek’s surroundings, allowing you to really connect with the way he sees and feels the world. My only criticism of the book is the pigeon English occasionally used to translate the Thai spoken by characters other than Dr. Amporn. Although it has no major bearing on the overall quality, I think standard English would have worked as well, or better. At the same time, however, I sympathize with the dilemma Jauvin faced here, since Thai doesn’t translate well word for word, and the fact that she couldn’t write in Thai because it has a different alphabet. She also needed to represent to the reader that these are people speaking Thai, and so broken English helps clearly make that distinction. If you have a book list, put The Boy With A Bamboo Heart on it. And if you’re short on cash, put it on your Christmas list. Whether you are a Thailand expat, SE Asia travel junkie or simply someone who loves a great book, there’s no question that you will find the heartbreak, courage and inspiration found amidst this pages a compelling read. A word of warning though: You will cry. And this is testament to the excellent job Chantal Jauvin has done in telling this incredible story of a street orphan who went on to establish an internationally recognised charity and save the lives of over 50,000 children.